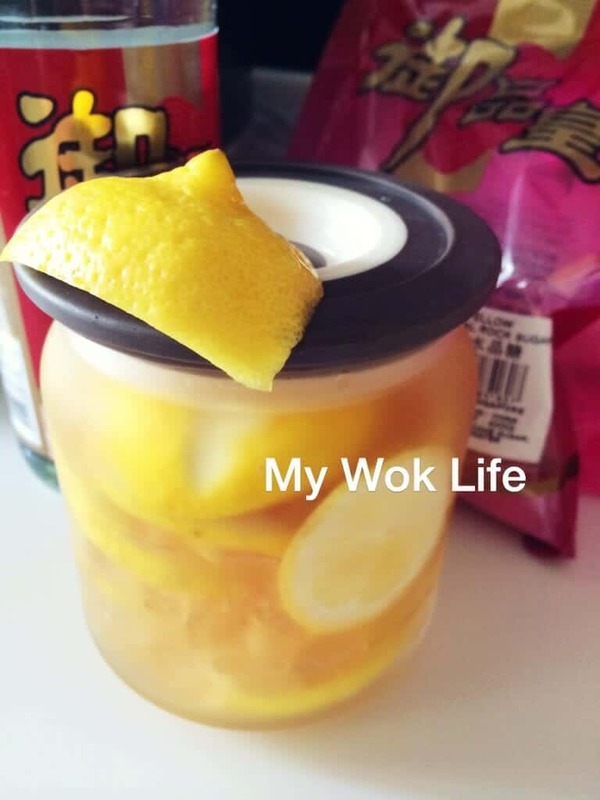 After one month of consumption of banana vinegar, I decided to switch I having lemon vinegar. Wasn’t sure which is more effective on loosing weight, but I knew they serve slightly different slimming purposes. As banana vinegar helps more on blocking carbs by having the banana on site, the lemon vinegar helps in preventing constipation problem. Both help in slimming, in a way. 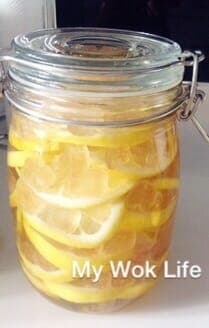 I have been taking this lemon vinegar for about 2 months now, none of the days had it stop me from going toilet smoothly. :D I read that it should even helps in getting rid of stubborn excreta in our bowel. So, do not be alarmed if you see very dark color stool. I ain’t expert. Personally, I just thought it has no harm drinking. Just take it as a healthier lemon drink, if you liked. It’s easy to make this beverage juice. (1) Rub salt on each lemon. Leave them for about an hour and rinse. Dry lemons completely with kitchen towel. (2) Clean and dry a large air-tight glass jar completely before use. (3) Slice lemons on a completely dry chopping board and knife. Hands must be dry, too, when handling the ingredients. Deseed along the process, if desired. (4) Now, arrange a layer of lemon slices in the jar, followed by laying a layer of rock sugar. Then, place another layer of lemon slices, followed by another layer of rock sugar. Repeat step till whole jar is filled. Pour vinegar until 90% full, or the top layer of lemon/ rock sugar is covered. (5) Close the jar old and leave it at cool & dry place (or refrigerator) for 2 weeks, before opening the jar to start consuming one tablespoon every morning once woke up (before brushing teeth). You may dilute a tablespoon of the lemon vinegar into water to drink. For a start, you may want to make half the portion size instead. Get a 1l jar and everything halves, or until it’s filled. Tips: If you have weak stomach or gastric issue, take it only 10min after meal. * Use mini rock sugar cubes for convenience. If you only have the large lumps of rock sugar, do crush it before use. * Any vinegar will do. I used distilled white vinegar the first time, and apply vinegar the second. * Glass jar with lid (Air-tight) is available at Ikea for only S$3.90. 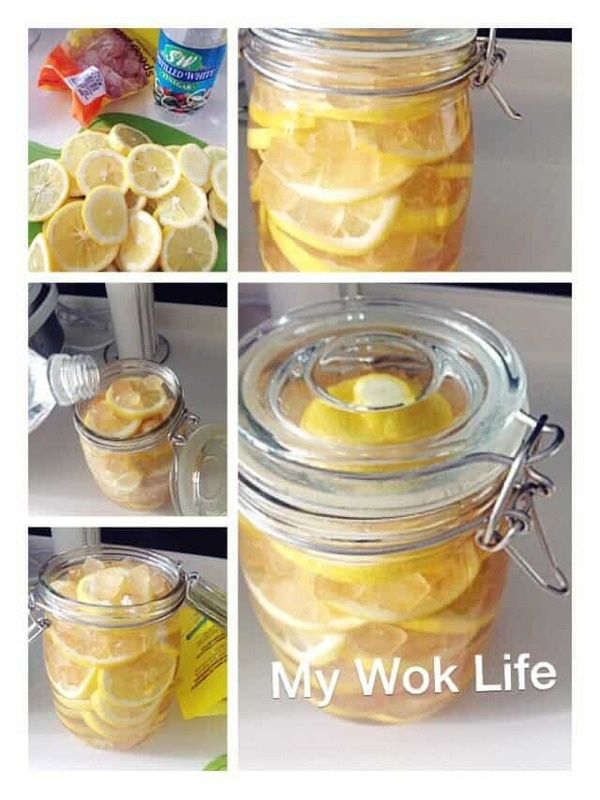 i just did something like this days ago but didn’t wipe dry the lemons. what will happen if the lemons were not totally dry when i mixed it with an organic apple cider vinegar after 2 weeks? Oh… Your mixture will not last and lemon slices might turn moldy very soon. The lemons might not be able to keep for long or as it supposed to be, if it is used wet without drying. The water on the lemon will turn it moldy fast. So, drink up quick, I guess. So we just drink the vinegar and what do we do with the lemon slices? Can we add more vinegar in or just throw them away after all the vinegar has been consumed? Also, we just need to leave it for two weeks before drinking? do we need to wait for the sugar to melt? Do we need to stir? Yes, just drink the vinegar or add into water to consume. Discard the lemon slices once you are done with the consumption as the pulps would pretty much disappear by then. Yes, just wait 2 weeks. Need not to stir as the rock sugar would dissolve by itself in days. thank you very much for your interesting internet comment. May I please ask why you use salt to rub the lemon skin? It would be great if you could explain the reason. Hi, may I know if unopened, how long can it keep in the fridge?? I did not try storing it in the fridge for more than 2 months. So, I could only confidently tell you that it shouldn’t be any issue for storing up to 2 months. I made the juice and soaked for three weeks, i found a layer of transparent jelly on the top. Do you know what is that ? Hmmm…. It sounded weird to me, too, and I have no idea, either…. Did you check the following questions? Did you store at cool and dry place? Was your storage jar washed and dried thoroughly before use? Were the lemon cleaned and dried before slicing? Also, what kind of vinegar did you use? I asked because I thought all these handling jobs matter to how well the lemon vinegar could be stored. It might be related. Seriously, I did not encounter such before for making so many times of this beverage…. Apologize for not able to help… Update me, if you found out otherwise? I also had this jelly-like thingy on top, it had been soaked for 8 days. I followed all the steps you given. Washed n dried the jar. Cleaned n dried the lemon. The vinegar I used was Bragg Apple Cider Vinegar. I also can see that my honey rock sugar had been broken up but it sank to the bottom, do I need to stir? Is it safe to drink? Thanks. I couldn’t advise as I did not encounter such with the fact that I have made this a few times. It’s ok if the rock sugar sinks to the bottom. You don’t stir it either. If you really do, use only clean and completely dry utensil. Would you like to keep in the fridge to try if it changes further? After 2 weeks fermentation, do we need to store the harvest in the fridge? Or can just leave it at the same cool & dry place? It’s up to you. Both ways are fine. All are sugars. You may go ahead to use the type of sugar you preferred. To me, I personally find the taste and mouthfeel of the cooking are slightly different with different kind of sugar used. For instances, rock sugar yields smoother mouthfeel in the palate, and its sweet taste is more pleasant to me. However, some may find it otherwise or no difference. Also, fine sugar usually processed with bleaching while rock sugar is less processed, in a way… After all, they are sugar. It’s ok to replace, if you are not really particular.